For all of you that looked at my project that was posted on 4-17-02 (first one on the list) here is the completed pictures of my project. My project was a Seeburg 148 cabinet that was empty and bare. My intention was to paint the outside a fancy color, put the lights in the red pilasters and do something with the lights in the dome. Then I was going to house my CD player in it and hook wallboxes up to the CD player using the Data Sync 200e wallbox adapter. There are some very important things I learned about the trashcan. Just because the 146, 147, and 148 look alike from a distance, they aren't. Needless to say I have some 146 parts left over that just didn't work with the 148 cabinet. But when you are viewing these pictures you will notice that the chrome trim on the door is not a 148 trim, it's a 146 trim. I bought a 146 door with all the trim and the door didn't fit but the trim was so perfect I couldn't let it go. So with a few modifications to the grill the trim was able to fit, thus the gold grill cloth is on the outside not inside. That is to hide a few holes that were originally drilled to fit the 148 trim. The selector buttons are also from a 146 but again they were in great shape and they fit so I used them. So don't ask me what model this one is, because it is just about all 3. But that still doesn't take away from how pretty she is. The paint is done with very fine multiple colors of metalic glitter. The side red pilasters have clear lights in them and are hooked up to a sequencer that makes a chasing light effect down the pilasters. The top dome colored lights is really cool. They are arranged much like the spokes of a bike. Each spoke has a different color, which includes, teal, fushia, purple and amber. They too are hooked up to the sequencer and give the effect of a turning wheel but also illuminate colors throughout the dome. I currently have 5 wallboxes hooked up to the CD player. My first one I hooked up was a Wurlitzer 5200 with Christmas music. 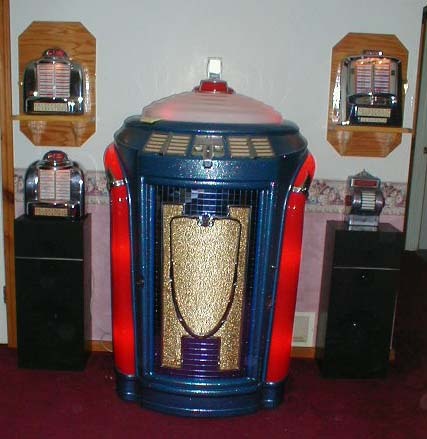 I since have hooked up a 160 select Seeburg 3WA, a Seeburg 3W1, an AMI 120 and a Seeburg 160 select consolette. Each wallbox has a different style music in it. Data Sync is currently creating an adapter that will hook up 4 wallboxes which I have the wallboxes waiting for and can't wait until they come out with it. I just wanted to let everyone see that this project is completed and also to thank Ann Marie and Ed at Data Sync for all their help. Copyright 2002-2004, All rights reserved for all content at www.cdadapter.com.